Kosher Passover gifts baskets. 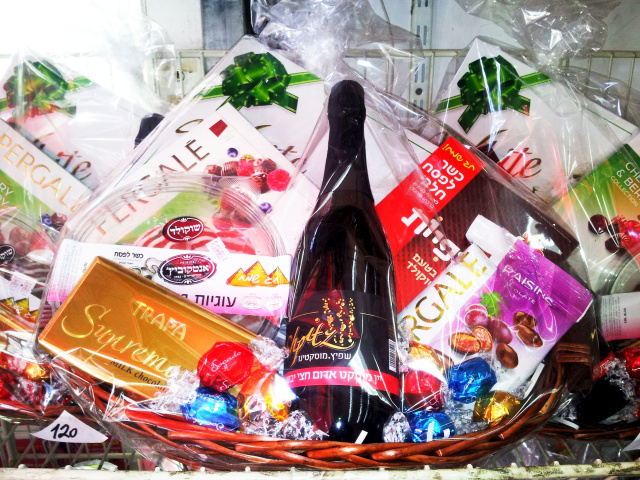 Pesach gift baskets. For alternative ordering process: orders@gift-israel.com or 972-52-242-7548. We will be happy to help. Online Israeli gifts-shop delivers gifts from Israel: kosher gift baskets, Israeli gifts, Jewish gifts & kosher chocolate flowers. Low cost local & international delivery is our specialty. Passover 2019 begins in the evening of April 19 and ends in the evening of April 26 In the USA, Passover ends one day later. Individually wrapped chocolates. Kosher for Pesah, kitniot free. Fresh fruit from Katif under the supervision of the Rabanut Harashit Rishon-Le-Tzion (arla,trumot,maasarot). a kosher certificate will be enclosed with those products. All packaged products have a reliable certification on the packaging. such as gourmet chocolates, dried fruit and wine cookies. A gracious gift that will be appreciated. Decorated with a pretty butterfly, symbol of social success and domestic happiness. filled with Passover Kosher chocolates (1lb) height 22"/55cm ...Happy Passover! mixed dried fruits( 2lbs). Pleasing to sight and taste. its VIP donors on their arrival in Israel. An impressive gift that will surely be appreciated at the Seder table. check out, using the pull down selection. Classic fresh and tasty Passover wine cookies. guaranteed to "wow" your loved-ones. (your choice at checkout).This gift is guaranteed to please your special someone. Presented in a fancy bucket this is a perfect Pesach gift. Tasty wine cookies and an assortment of gourmet chocolates. chips, assorted nuts and gourmet chocolates. A neat passover gift for the whole family. A great centerpiece gift for the desert table. It combines Cabernet Sauvignon or Merlo best quality Kosher Dry Red Wine. Gourmet Pareve chocolates and wine cookies. It will surely be appreciated....happy and kosher Passover. in a lovely presentation of gold net & bow. Lovingly decorated with flora & pearls. An adorable white dove will bring your personal wishes to a delighted recipient. decorated with flora and 3 mini plants of chocolate flowers. No limit to your thoughtfulness. in a lovely basket decorated with flora and pearls a cheerful holiday gift. 1lb of gourmet chocolates presented on a reusable tray decorated with bow and flora. chocolate flower. It will be enjoyed, guaranteed. such as cake, Bamba snack, Osem's potato chips, gourmet chocolates and SweetBouquet's cheerful chocolate flower. With your personal message it will be greatly appreciated. 2 cheerful Sweetbouquet’s chocolate flowers. Everyone's favorite snacks (1lb): gourmet chocolates, dried fruits, Pesach cookies. message to make one's day very sweet indeed. kosher for Passover cookies and chocolates. Together with your personal message it will bring joy and delight. A gift that fits the occasion. You can add this lovely arrangement of gourmet chocolates (1lb). It is presented in a gold net and bow. What a great add-on for children. Each its own, make them feel great! snacks: sweets, chips, bamba, chocolates. For fruits lovers...and chocolate lovers, the perfect mix with the finest selection of both! Mouthwatering fruits (12lbs) with rich savory pralines (1lb). fresh fruits with dried fruits in gift baskets shipped to the US. - toffee candies - bonbons. This gift delivered with your personal message will totally delight. Quality chocolate pralines - Belgian style wafers. mouth watering fruit and flora decor. Nice! Complete Pesach celebration in one basket. For the Seder table pleasure. A perfect assortment of gourmet Passover products.